The knitting has not been coming along lately. 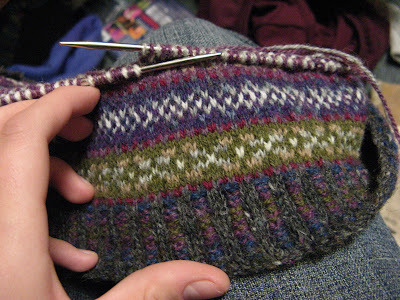 I've finished a mindless-project sock and started the first sleeve, but my left wrist is acting up. I'm trying not to knit too much, especially since using small, metal needles with scratchy yarn aggravates the pain. I found my wrist brace, though. I'll probably just have to knit on through, because less than a quarter of the first sleeve is not good enough progress for week 3! 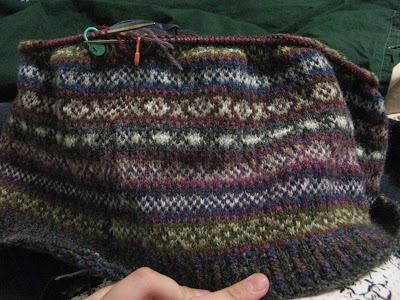 I am two peerie repeats away from finishing the body and yoke of the sweater. Arrrrgh. This has taken me a lot longer than I expected. First off, the pattern does not line up with the photograph in the book, so I've had to take a wild guess at the sequence of the peerie bands. Second, there are decreases at both the armhole edge and the neckline, so the beginning of the pattern shifts pretty drastically. I've had to go through and make sure that each peerie band is directly above its sister bands in the body of the sweater; although I'm pretty sure that it wouldn't be very noticeable if the pattern were shifted a few stitches, it would bother me a lot. There is also the matter of decreasing from 322 stitches down to less than 200. Luckily, at this point the sweater is in six sections on the needles: two identical sections of around 35 (and constantly decreasing) stitches for the right and left fronts, two armhole steeks (10-stitch columns that will be cut later and the arms sewn on), one front steek (same type of column, but this one for the v-neck cardigan-style button band which will be picked up later), and one long back section. 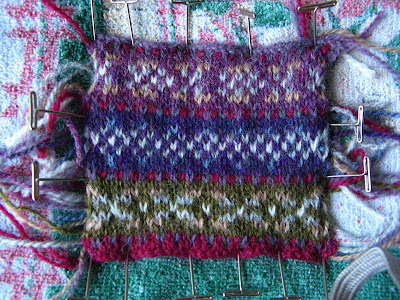 This makes it easy to count the decreases on the right and left fronts, which eases the task of counting a hundred-odd stitches, which makes my life a lot less limb-gnawingly frustrating. 1. Until relatively recently, Fair Isle knitting was a product-based industry rather than a craft. Women in Shetland would knit Fair Isle sweaters (called jumpers) to supplement their income, turning them out at an incredible speed and giving them to local vendors, who would then give the women store credit rather than paying in cash (a practice called trucking). 2. 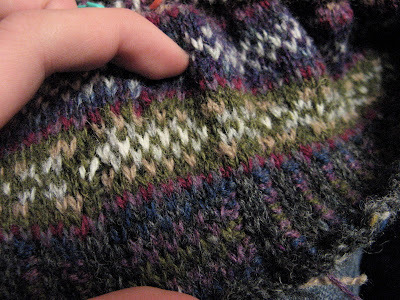 There is a difference between Shetland and Fair Isle knitting. There are many debates over the interchangeable use of the two terms and what they mean. Shetland knitting tends to be simpler, usually with a short repeated pattern; in the book, an example of Shetland knitting is a pair of gloves with a vine and leaf pattern in black and white, with very simple instructions for the leaf and no shading. 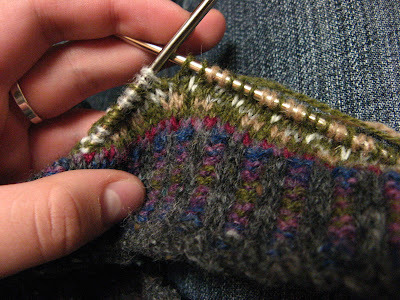 Fair Isle incorporates more colors, uses shading to create depth, and has longer patterns often based on the XO motif. 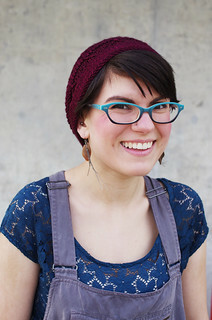 Technically, what many knitters have taken to calling Fair Isle is actually stranded knitting, which is a generic term for working with more than one color. 3. Although chemical dyes are used today and thus, more colors are possible, Fair Isle knitting have always been rich in color. Before dyes came to Shetland, wool was dyed with plant products or simply grown that color on the sheep. Now, sheep are usually white so that the wool takes dye easily, but in the past, the color of the wool ranged from blue to black to pink, depending on the breed. I say that it's been humbling because reading about incredible knitters who can finish a 44-in. sweater in a week makes me feel somewhat inept. I've learned so much about the technique just by knitting the sweater, making mistakes and changing my technique as I go (although I still knit with both colors in my right hand - I just like to knit English rather than fiddling with Continental in one hand and English in the other), that I think I'll be much more confident in tackling sweater projects in the future. Especially since most of the sweaters I'll knit in my lifetime will not have 12 different colors. Winter Term started yesterday, as did progress on my Fair Isle Cardigan from Veronik Avery's gorgeous book, Knitting Classic Style. Over winter break, I picked up 25 balls of Jamieson & Smith's Shetland Jumperweight at Weaving Works. I swatched on the 30th, washed and pinned it out on a little piece of cardboard from the garage. (I got gauge, 32 st./4 in. and 33 rows/4 in. ! Yaaay.) I also found a mistake in the color chart. See, swatching is good for you, right up there with lima beans and dental surgery! If you look at the third row of pattern, you'll notice that there is an X pattern and a little Pac-man trying to eat each X, but this is not what the pattern looks like in the book. There should be one more cream stitch in the middle, making Pac-Man into a boring old oval. But wow, this yarn. The colors are surprising and beautiful, jewel-like in appearance and deeply textured. 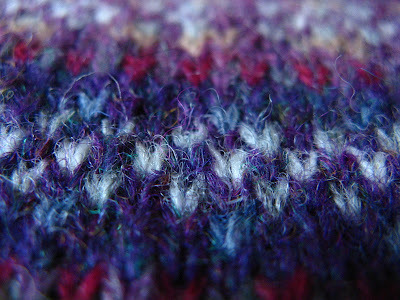 Some of the colors are not pure, but heathered or tweedy: the dark purple has undertones of bright green; the light gray has long, thin strands of black running throughout. The yarn is very grabby, so it blends together well and creates a dense, yet light fabric with incredible stitch definition. I cast on and started knitting on New Years' Eve, did a few rows New Years' Day, and started in on the main body pattern yesterday. I worked for about 6 hours yesterday and another 6 today. I plan to knit for as long as I can stand tonight. I am hoping to finish all 3 repeats of the 8-section Peerie pattern by next Thursday or Friday, but I expect it to be the most time-consuming part of the sweater. Well, besides the period of recovery after biting my fingers off, throwing a temper tantrum, heavily medicating myself with caffeine of various types, and finally cutting the steek so that I can pick up and knit the button band. Every single 323-stitch row takes forever. I'm hoping that after finishing every different pattern once, it will be easier the second time. At this rate, I will be knitting until I die. .....well. I will be knitting this specific sweater until I die. Color changes. They leave looseness or a big ugly hole. Last night, I went to bed discouraged, thinking that I couldn't change their placement - but oh hey, I totally can! All I have to do is change in the middle of the steek instead of the beginning of the round. That way, the ugly looseness will be in the middle of the steek, which will be conveniently cut in a few weeks. See the distorted white stitch on the left? This is where the color change was last night. Now, it is in the middle. The stitches to both sides of the color change are similarly sloppy - but completely unseen in the final garment, unlike the previous placement. More tomorrow. Hopefully, I will be reading Alice Starmore's book on Fair Isle, as well as Anne Feitelson's incredible resource book, The Art Of Fair Isle Knitting. I'm sure Elizabeth Zimmerman (as usual) will have something to say in the matter, and Eunny Jang's guide to steeks is both fascinating and incredibly informative.